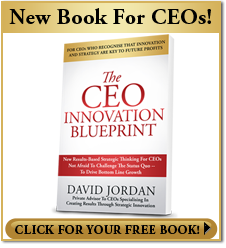 In my book The CEO Innovation Blueprint, I talked about being careful not to copy or follow other innovators. It’s very simple: it’s a very quick way of solving a problem–somebody’s come up with a great way of doing something and everybody tries to follow, and copy, and duplicate. The problem is that often that organisation has grabbed the market share already and the only way that you are going to compete with them is through price. What’s also very interesting, one that I’ve often raised with CEOs, is often digital disrupters aren’t profitable. There are a number of digital disrupters’ organisations that are growing but they haven’t made a profit and their revenue is struggling to cover the cost. So if you’re thinking about trying to compete with an organisation that can’t make a profit by doing exactly what they’re doing, you’re running into a lot of troubles. It’s very important to step back and actually think about how you can differentiate yourself. That disrupter might’ve identified the problem, but how could you solve that problem in a different way and how could you organize to do that while solving a whole lot of other problems? And so it’s very important; don’t follow what the digital disrupter is doing but actually consider how you could leapfrog the digital disrupter, and how you can differentiate yourself. When we’re looking at digital disrupters and how we can defend ourselves against them, we need to understand what it is about the digital disrupter model that is making such a difference. And probably one of the key issues about digital disrupters is that they’re actually focused on cutting out the middle man. Look at the top of digital disrupters like peer-to-peer lending. Peer-to-peer lending allows the person that’s lending the money to talk directly to the person who wants to borrow the money without him paying money to a middle man called a bank. So if you’re trying to compete against a digital disrupter whose whole focus is to take you out of the transaction, then you need to rethink about what your business is about. And this is a very important thing, that we go back to that same question: “What is the problem that you’re solving for the customer?” Because if you can add value to the transaction, then the customer will keep you in the transaction. If you’re not adding value to the customer, then they’re very happy to bypass you. So again, when you’re looking at the digital disrupters, don’t look at the technology; look at how you’re adding value to your customer. Moving on from thinking about the digital disrupter, one of the challenges that comes on is that a lot of what’s happening in the business world at the moment is having impact on price. We’re finding that competitors are driving down price. What’s very important with innovation is not to actually do something that reduces your revenue but to work out how you can increase your revenue. When I was talking about the digital disrupter, how I can compete against them, it is to make sure I don’t end up cheap like them. I shouldn’t be cutting my margin. Instead, I should focus on how I can add value, and justify why I should charge the price that I would like to get for the organisation. A very good example is a situation that happened in the United States, in a country town. We had a father who was running a hairdresser, the only hairdresser in the town, and it was employing a number of people and making a reasonably good trade. Along came a company that just cuts, looking at volume, and was price-sensitive. So they came in, they were offering $6.00 haircuts. And this family-owned hairdresser started losing its customers. And it’s really important to think about this, that the organisation that was looking at driving volume and price wasn’t looking at how he added value to the customer. Should you duplicate what they’re doing and cut your profits? Or should you look at how you can add value to that business? You need think very carefully when you’re dealing with a digital disrupter. don’t follow then mental model of cutting your revenue. 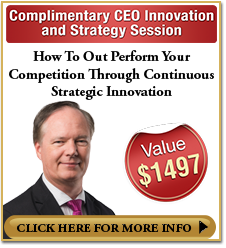 One of the topics that the The CEO Innovation Blueprint touches on is about roll-up reporting or corporate reporting. If you think about how businesses have changed over the last ten years and what the requirements of the board are in the last decade, the needs of the executive and the boards have outgrown the reporting systems in the organisation. 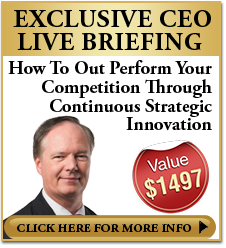 You’re a CEO, you’re trying to drive change, trying to drive growth, trying to drive profit. You’re coming up with new ideas. You’re trying to be an agile business. You’re trying to be a lean business. You need to understand where the business might be in two years’ time. You need to be reacting to what’s happening with your competitors. And your reporting system tells you what happened last month. How’s that helpful? It’s nice to know, but you can’t change what happened last month. You need to know what could happen next month to drive that change. So if you’re a CEO who’s looking to be a competitor, dynamic, and responsive, you need to really think about how you can change your corporate reporting systems and strategic systems to actually support you in that drive.